Before I met Mr Thick in 1998, I had no idea that anything existed beyond the Microsoft-PC realm. We had a HP desktop at home, shared by Sista and I, and it was enough for us to surf the net, chat on ICQ (I feel so ancient saying this!) and work on Word documents. And then along came this man, who was all Apple is the greatest! even though those machines cost an arm and a leg. I mostly ignored his fanboy and geeky antics because I was NOT. INTERESTED. I just want to surf the net and chat on ICQ, okay? In 2002 though, something turned me into a fruit-loving maniac: my baby, the iMac G4. Remember that cute little computer that didn’t look like a computer? The HP was falling apart after four long years and I was looking for a replacement. The machead was all, BUY AN APPLE, WOMAN! 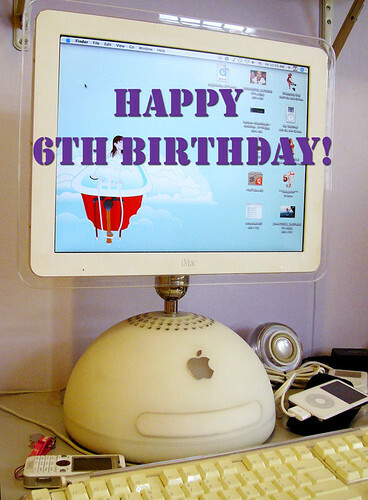 Conveniently, Apple had just launched the iMac G4 and luckily for him, it was love at first sight. I loved, LOVED it. I had never loved a gadget before. And so it became mine and I called it my baby. I loved how adorable it looked, loved that the screen can swivel, loved the cutie patootie speakers, loved the way the OS was so easy to master, loved how the desktop images could change every five minutes. And that began my love affair with Apple. For six long years, my baby was everything that I needed in a computer. Despite all the newer MacBooks and iMacs that were launched, I held on to it. It was whimsical, gorgeous, reliable and it was mine. Since that moment when I picked up my iMac G4, we’ve accumulated a fair number of Apple gadgets. Between the two of us, we have: a MacBook, a MacBook Pro, two iPhones, two iPads (1 and 2), an iPod 5G, a iPod shuffle, two iPods 1G, a iBook 3G and that humungous desktop of the man’s (whose generation and name I have forgotten). We loved each and every gadget. 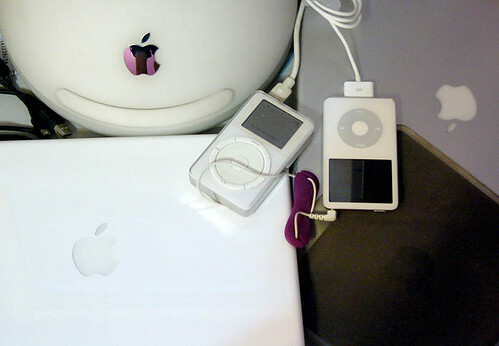 There are a number of reasons why we have been such Apple fans and I think a lot has to do with the fact that we are both very aesthetic people. We love clean, minimalist designs that combine form and function effortlessly, and Apple gadgets are truly the most beautiful electronic gadgets in the market. Their software are intuitive and I’ve never had any problems adapting to the apps, whether it’s iOS 5 or iMovie. Also, we have both been very lucky in that ALL our Apple gadgets have worked beautifully and have had long and fruitful lives (couldn’t resist the pun, hee hee). My iMac, for instance, was my primary machine for six long years and I only gave it up after I picked up a camera and needed a machine that had the power to edit RAW photos. I suppose I am waxing lyrical about Apple because I am feeling a tad sad that Steve Jobs has resigned from the company. For many years, his keynotes have been the stuff that husband stayed up till the wee hours for and his outfit of black turtleneck top and jeans are as familiar to us as, oh, I don’t know, our computers. We’ve looked forward to each and every launch. Will Apple still be Apple sans Jobs? Heck, yes. Will we still love Apple? But of course! Will husband name his daughter Apple or Lisa? No, but nice try. Right now, however, I am thankful that Jobs went back to Apple in 1997 and went on to create those amazingly innovative products that we love and, most importantly, use. Jobs is really a visionary – you can see how Apple kinda lost its lustre in the late ’80s when he left, and was transformed when he returned! And I love your Apple family! 🙂 Isn’t it funny how the base your Imac G4 looks absolutely huge now? I LURVE Apple too the very moment Dan got us our first Apple comp. It was an old refurbished MacBook. We didn’t buy a brand new one just in case we didn’t like switching to another OS. We needn’t have worried – it was all so intuitive. And you’re right about Apple products lasting just about forever. We took that old MacBook on our 10-month long backpacking trip and it only conked out once (we suspect sailing into the creepy Bermuda Triangle might have had something to do with it…) It survived the trip and now it’s been shipped to the Philippines where our helper’s daughter is still using it for school. So yes, this is a nice ode to Apple and Steve Jobs. I’m never buying a PC again! Yi Lin: That’s such a cool story about your Macbook! So nice that you gave it to your helper’s daughter. And yes, no PC for us too!